Astute Lexus Enthusiast readers may identify me as the “bucket list item checked” owner. While it may seem like fiction, what I’m about to share is nothing short of luck, luck, and more luck. As you might recall from my previous post here at Lexus Enthusiast, my wife and I had a LFA on order, we decided it would make the ownership experience even more meaningful if we knew more about how the LFA was produced. Although several articles have been written about the LFA factory tour before, I hope to share with you my personal account of the whirlwind Japan trip to visit the birthplace of this magnificent vehicle. 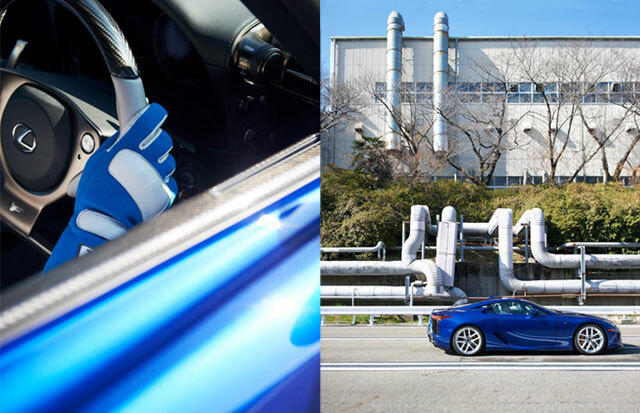 A trip to Japan is no small journey, so we decided to maximize our time in Japan by visiting both the LFA factory and the Tokyo Motor Show. For those of you who have travelled to Japan before, you will agree that the logistics of getting around Japan is not exactly easy for foreigners, but Lexus was very flexible in accommodating our itinerary to allow this to happen. Traveling from the USA, we flew into Nagoya (which is close to Toyota City & the LFA factory), and in typical Lexus fashion, someone was waiting for us at the airport. Lexus went the extra mile and provided an interpreter so we could get around easier, who accompanied us to our hotel in a Toyota Crown. Getting what little sleep we could with the jet lag, we managed to drag ourselves out of bed the next day and toured through Nagoya. We had planned an extra day of buffer in case of flight delays, which gave us a chance to explore this beautiful city. Now, I’ve been raised that if you’re early, you’re on time, and if you’re on time, you’re late, but because Toyota is so efficient, everything is scheduled down to the minute — being early in this case would mean waiting, because no entry into the plant was permitted until the agreed-upon time. So, after our slight detour (we picked 7-11), we arrived at the front gate to the Motomachi plant, which is a fully functional production facility in Toyota City where many cars are produced — only part of the plant has been recommissioned to produce the LFA. After the entry gate, we met up with our official LFA Works tour guide, and as an added bonus, LFA chief engineer Tanahashi-san joined us for a very personalized tour. To put it simply, the level of care that Lexus takes in producing every part of the LFA is amazing. Some machinery is needed, but much of the work is done by hand via skilled artists — not only do the LFA production team members have experience in their craft, they also must exhibit beyond-excellent work quality. Lexus has handpicked these individuals from different parts of Toyota to form this LFA team, and they were all masters at what they do. 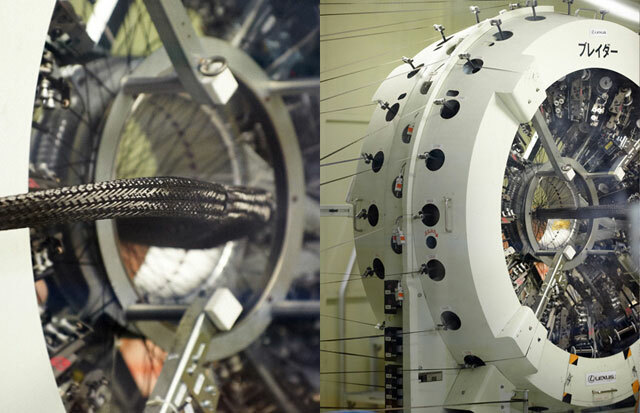 To start with, the first part of the tour was all about carbon fiber (sorry if I leave out some of the finer details of the tour, but I would hate to give out any trade secrets or incorrect technical information). 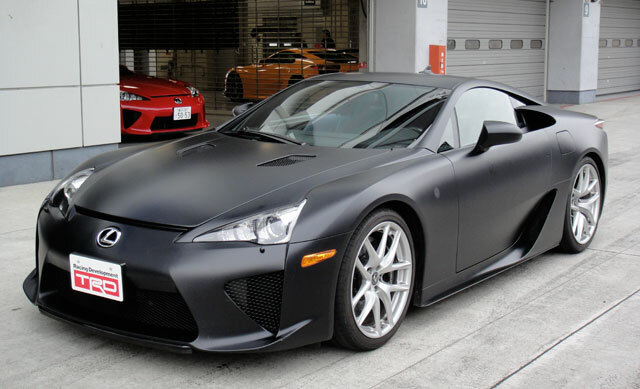 One variation of carbon fiber used in the LFA requires many “layers” to be cured on top of each other, and a time schedule (right down to the minute) is posted stating exactly when a specific layer is suppose to be applied — this goes back to the precision Lexus has worked into the production process. We were also lucky enough to see the loom (or as they call it “the braider”) in action. Very intricate — just fascinating. Seeing numerous LFAs in various stages of completion was a real treat, and we were fortunate enough to see an LFA shell being joined with its underlying mechanics. This merging of the car is done by hand – not by robots, though of course mechanical aids are used to lift and move. Every detail of every move performed by the team is logged in a thick binder for every LFA — no guess work is left, and everything is double checked, even triple checked. Last on the tour was quality control, where resident test driver, Amano-san, was waiting for us in a white LFA prototype used for testing. Tanahasi-san was nice enough to let the test driver take us around the Motomachi test track, and while it’s smaller than a typical race track, we were still able to hit 245 km/h — a true testament to the LFA’s speed and agility. Fast acceleration is not the only test criteria — the test track also stressed braking, banking, and overall driving dynamics of the car. 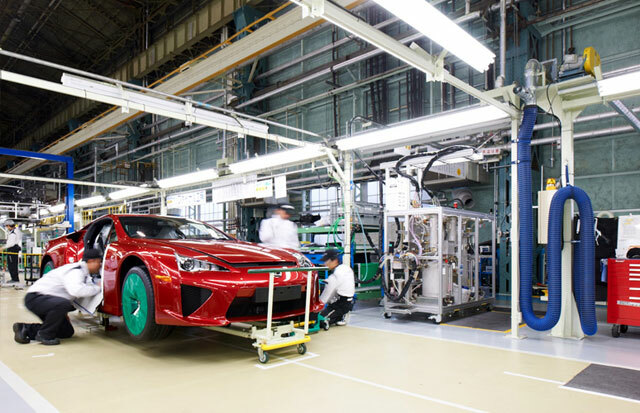 Amano-san personally test drives every single LFA before it goes to the customer, which is part of a rigorous two week minimum QA period that every LFA goes through. Now, even though all of us are thinking Amano-san has the best job on Earth, he’s putting his life on the line every time he stress tests these cars. Even after just taking us for a couple of short laps, I can see drips of sweat running down his forehead — that’s the level of concentration he puts into every drive of the car. His professionalism is second to none. As the LFA Works tour wraps up, my wife and I are smiling ear to ear, because next on our itinerary was Mount Fuji and the Fuji Speedway. 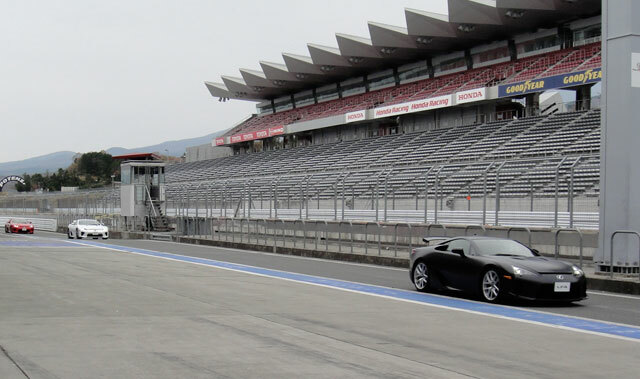 Our timing was perfect — Lexus was having a press event at Fuji Speedway, and we were lucky enough that they squeezed us into the event after a “nominal” fee was paid (FYI, everything is relative). 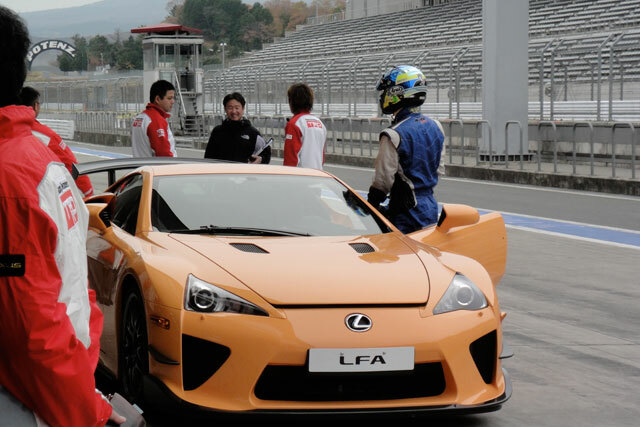 We were on the list to pilot the LFA on FUJI SPEEDWAY! Surrounded by LFAs – my wife and I were in automotive heaven. Chief engineer Tanahasi-San describes the sound of the LFA as “the roar of an Angel”, and I don’t believe Shakespeare could describe it better himself — the sound of each one firing up (there were easily 5 or 6) was intoxicating. The Lexus/Yamaha developed engine racing to redline is something every motor head has to experience in person. Getting into the LFA was like coming home after a long trip — everything just seem right. At this time, we had not taken delivery of ours yet but the LFA is so driver focused, it was like I just drove it yesterday. Even with the steering wheel on a different side, the LFA felt comfortable. Never did I feel awkward. Part of the LFA design principle was driver centricity, and I think they accomplished that with flying colors. Just like our Nurburgring experience – Lexus put together a lead / follow setup with professional drivers leading the way in an LFA. We were tasked with trying to follow none other than Iida-San, the record holder of the fastest Nurburgring production car lap time. The track itself is considerably smaller than the Nurburgring, and it’s very challenging — the turns come quickly one after another. We zoom around the track hitting 250 km/h in the finishing straight. The car didn’t even break a sweat — it felt at home, which makes sense as much of the LFA’s development was done on this track. Since we have such a great relationship with Iida-San, during our professional driver hot laps, he took my wife out onto the race track, and drifted part way through the course … yes, in an LFA. What a treat. As the Fuji Speedway event ended, Tamura-San asked me, “Will you be at Spindle Night?” Of course, I was scratching my head — I had no clue what “Spindle Night” was. The moment I responded, he picked up his mobile phone and next thing you know, we had an invitation to attend what would turn out to be a very special event. So ends the first part of our friendly LFA owner’s story — please check back tomorrow for the second and final part. 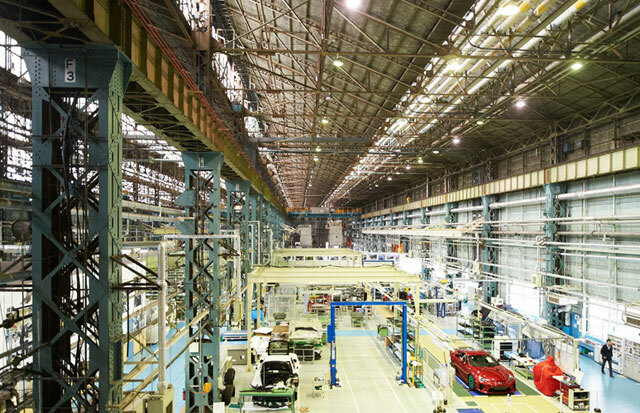 Also, special thanks to the folks over at Lexus Magazine, who gave me permission to use their photos of the Lexus LFA factory from their photo essay. Lexus LFA: The Best Trip Anybody Could Wish For. Crux: Is there an app to turn this essay into a video narration? Reading hurts my heart.